Just had a wonderful day walking the length of Tiree. At just twelve miles just a step compared with 1058 miles around Wales, but still the length of a whole island! I got back to Tiree just over a week ago, on Monday 5th. On the way over I had wondered about doing a walk on the island so that some of the people here could join in. As we drove off the ferry, we passed a few folk we knew walking off and shouted hello through the windows, then Fiona said, “look”, and as I looked ahead (not a bad thing to do when driving along a pier), I saw a crowd of people waving flags, with champagne popping. It was a wonderful moment and one I had not imagined. 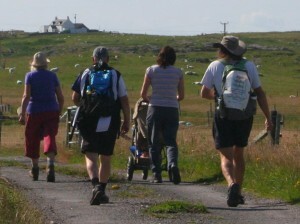 So, it was lovely to be able to share a bit more of the feeling of the long walk, by walking the length of Tiree. 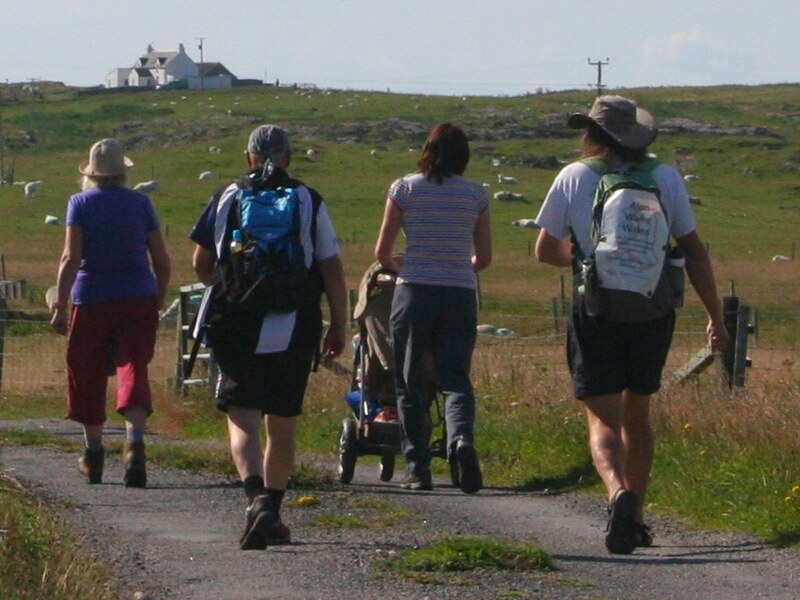 With the Coll Half Marathon and 10K next weekend, there wasn’t going to be a perfect time for everyone, but eight of us walked together, some for the whole way, some having to break off for dentistry or conserving feet for the 10K on Saturday. We started in Caolis at the North East and walked on roads and beaches, within lunch sat outside Dorinda’s gallery in Scarinish, a quick cuppa at my house in Crossapol and then finished down at the Skerryvore Lighthouse Exhibition at Hynish. During the walk we talked a bit about the combination of commitment and perseverance that has to take over when physical and mental endurance fail, and Dorinda told me about the people of Galacia in Northern Spain, another Celtic area, whose traditional dress is just like in Wales.